خربشات وسام: شاعر الكمبيوتر !! You installed the best in me. Your picture is always in my background. You clicked my heart gently. You drive me crazy when I see you. Your love reset my life and deleted all the sadness in me. You restored my kindness after I thought it was corrupted. I'm always connected to you with more than 56 heartbeat per second. You hacked my brain and registered your name in it. You are the only one that could navigate my feeling sand explore my emotions at the same time. I feel lost when I try to call you and you are not responding. I always feel you close to me when I shutdown my eyes, or when I open my windows waiting for you to pass. 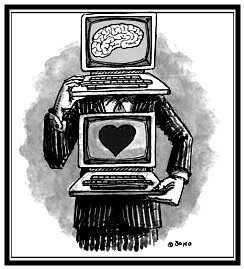 You are the only one that can log into my heart and never log out. I dream of being your only servers long as I live. You don't have to search for me,cause we are always linked to each others. I see your name everywhere, my FrontPage, my homepage and all my software. I scanned my life and found that I'm only infected by you. You are the virus I'd never remove, and why should I do?. You formatted my life and added happiness to view. I love you more than my CPU.